WASHINGTON, Nov. 15, 2018 /PRNewswire/ -- LUNGevity Foundation, the nation's leading lung cancer-focused nonprofit organization, has launched a new PSA campaign encouraging people diagnosed with non-small cell lung cancer (NSCLC) to speak with their doctor about biomarker testing at the time of diagnosis or recurrence. Science has advanced to a point where clinicians can often detect unique characteristics of a patient's tumor through biomarker testing and then prescribe personalized, biomarker-driven treatments. These treatments can result in improved outcomes and quality of life―truly precision medicine. Biomarker testing is essential to precision medicine because it identifies which treatment options, including targeted therapies and immunotherapies, are best suited for each patient. Because lung cancer is not one disease, but a collection of different subtypes of the disease, each subtype may require a personalized treatment option. "Today's deeper understanding of the multitude of biomarkers associated with lung cancer―driver mutations like ALK, EGFR, ROS1, BRAF V600E, and immunotherapy biomarkers such as PDL-1 and tumor mutational burden (TMB)—has enabled scientists to develop life-changing treatments," said Dr. Upal Basu Roy, Director of Translational Research Program/Director of Patient FoRCe at LUNGevity Foundation. "Since 2015, the US Food and Drug Administration has approved 25 lung cancer treatment approaches, the majority of which are biomarker-driven―and this list continues to grow. Patients need biomarker testing to qualify for these treatments." "Lung cancer is at the forefront of precision medicine, yet far too many patients have not had the benefit of biomarker testing of their cancer," said Andrea Ferris, President and CEO of LUNGevity Foundation. "The new Inhale for Life biomarker videos will increase awareness about the value of testing and encourage people to ask their doctor if testing is right for them. The hope that these survivors' stories represent—from that of Emily Daniels, a mother of two young children, to that of Juanita Segura, who owns her own CrossFit gym—will also help demonstrate the meaning of living well with lung cancer." 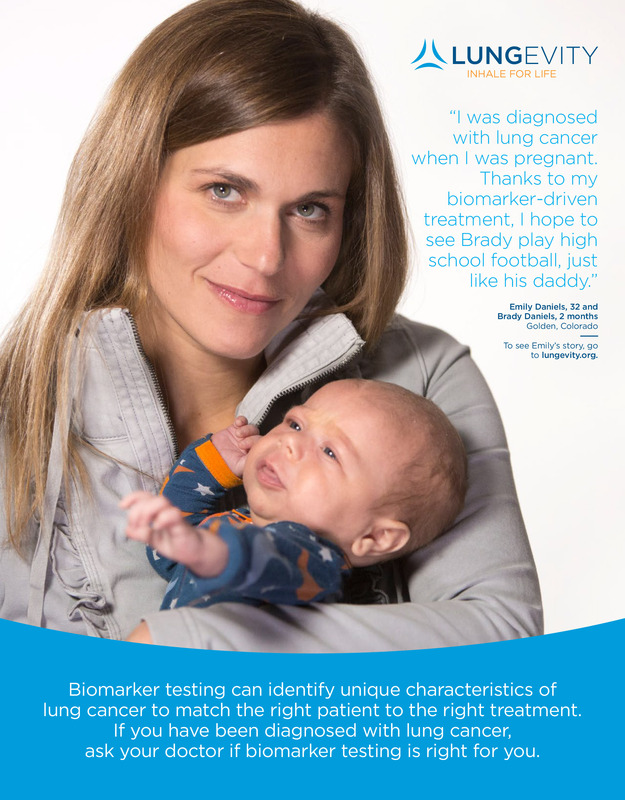 The Inhale for Life: Biomarker Testing campaign, launched in November to coincide with Lung Cancer Awareness Month, was supported in part by grants from Bristol-Myers Squibb, EMD Serono, and Foundation Medicine. This campaign is part of LUNGevity's broader efforts to promote precision medicine in lung cancer and ensure that patients have access to it. LUNGevity strives to make biomarker tests a standard of care and ensure that testing is covered by insurance more than once in a patient's lifetime in order to achieve personalized treatment. LUNGevity is the nation's leading lung cancer organization investing in life-saving, translational research and providing support services and education for patients and caregivers. LUNGevity's goals are three-fold: (1) accelerate research to patients, (2) empower patients to be active participants in their treatment decisions, and (3) remove barriers that patients face in accessing the right treatments. LUNGevity Foundation is firmly committed to making an immediate impact on increasing quality of life and survivorship of people with lung cancer by accelerating research into early detection and more effective treatments, as well as by providing community, support, and education for all those affected by the disease. LUNGevity's comprehensive resources include a medically vetted website, a toll-free HELPLine in partnership with CancerCare®, a unique Lung Cancer Navigator app, peer-to-peer mentoring for patients and caregivers (LUNGevity LifeLine), and survivorship conferences. LUNGevity also helps patients find and navigate clinical trials through our Clinical Trial Finder tool, a Clinical Trial Ambassador program, and participation with EmergingMed.